Dr. Mitchell was born and raised in East Point, and he’s been serving dental patients in the same area for 30+ years. He graduated from Greater Atlanta Christian School in 1975 before attending Harding College (graduating in 1978). He then earned his doctorate from Emory University School of Dentistry in 1983. Today, he is an Auxiliary Staff Member at Atlanta Medical Center – Well Star South Campus, as well as a proud graduate of the Dawson Academy and member of the AGD and GACD. His favorite part of the job is meeting new patients/friends every day and being able to educate them about what dentistry has to offer! He LOVES dentistry, and enjoys coming to work each day to share his practice with such a wonderful team that make it all possible. 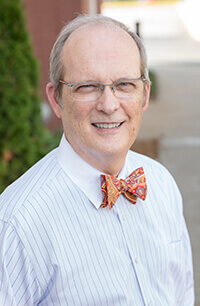 Something else interesting about Dr. Mitchell is that he is the direct descendant of a Civil War General (“Fighting Joe Wheeler, the Savior of Newnan”) on his mother’s side and full-blooded Cherokee Indian on his father’s side. Essentially, he is a multi-faceted melting pot, just like all of Atlanta! Enough about him, though – he looks forward to talking about you at your next appointment.